On Nov. 30, 1906, George Parker Bidder dropped a bottle from a boat into the North Sea. The weighted glass bottle sank almost to the sea floor, and then bobbed along for 108 years, 4 months and 18 days until its journey finally ended when Marianne Winkler, a retired postal worker on holiday on Amrum Island, one of Germany's North Frisian Islands, found it washed up on shore in 2015. 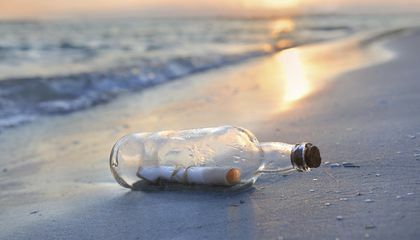 Though she didn't know it at the time, the message in a bottle was the oldest ever recovered, and earned Winkler a spot in the Guinness Book of World Records. When Winkler first found the bottle, she could see a message inside telling her to break it open, but she hesitated. Winkler and her husband could tell that the bottle was old and they didn't want to damage it, Maev Kennedy reports for the Guardian newspaper. When they finally got the note out, they found it was actually a postcard addressed to G.P. 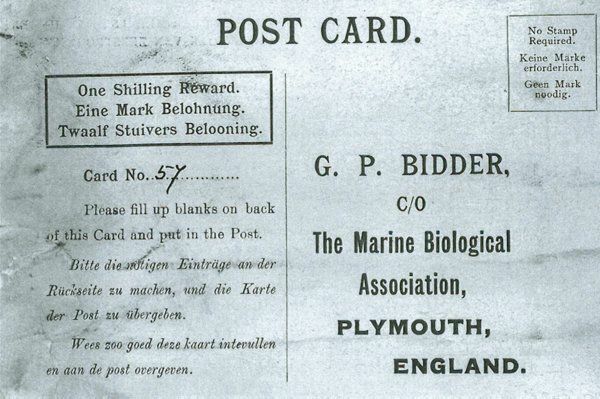 Bidder at the Marine Biological Association in Plymouth, England. It promised a one-shilling reward. The Winklers filled out the card and posted it in an envelope. Luckily, the Marine Biological Association still exists. According to a press release, the association was surprised and thrilled to get a postcard addressed to its former president, who died in 1954 at the age of 91. According to Corey Fedde at the Christian Science Monitor, the staff searched around on eBay to find a shilling, a unit of currency that went out of circulation in Great Britain in the early 1970s, to send to Winkler. Winkler's bottle was not the only one Bidder sent to sea. Between 1904 and 1906, he released thousands of bottles with postcards in them as part of a research project to map currents in the North Sea. He used special bottles he called "bottom-trailers," which were weighted so they would sink, but had a piece of stiff wire attached to keep them off the seafloor. The idea was that fishermen trawling the sea would find the bottles and send them in, something the MBA says might be one of the first citizen science projects ever recorded. "This was the best technology available at the time," Guy Baker, communications officer for the Marine Biological Association tells Fedde. "The bottles were [Bidder's] own invention. It was the first time instruments had been made that could record the currents, but it depended on fisherman to report the finding." The Marine Biological Association reports that about 55 percent of the bottles were returned, and that the experiment was a success as it showed the East-to-West flow of the North Sea's currents. Bidder's bottle breaks the previous record for finding a message in a bottle. The previous record went to a bottle that spent 97 years and 309 days at sea, which was found by a Scottish skipper near the Shetland Islands in 2012. Why have people used bottles for their messages? People used bottles for their messages to preserve the content inside. When something is immersed in water, it tends to get wet. This would defeat the purpose of dropping a piece of paper into the ocean, as it would be destroyed. Bottles are water-repellent, so paper would be relatively well-kept inside it. So, a bottle could traverse the sea while keeping its message safe. I was surprised that the person who found this message was able to unravel the paper. After 108 years, the paper would have been more likely to decay. To have found the oldest message in a bottle now I would become famous. I would try to keep it if i could. This is super cool! I would love to find one of these because it seems like a really important part of our history. People have used bottles because they can be air-tight and keep anything from getting to the paper. This preserves the message for hundreds of years. How would you survive wwii or 1 worth out dying and how would would you eat healthy with everything bad going on. Around you. Based on what the article said, writing a note and putting in a bottle was the best technology at the time. Because back then there was no internet so that they have send it the old fashion way. Because that was the best technology they had.